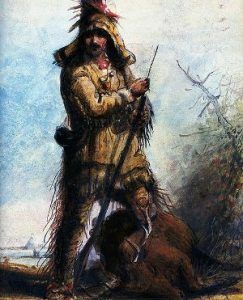 The men who responded became known as “Ashley’s Hundred.” For the next three years, the Rocky Mountain Fur Company made several large scale fur trapping expeditions in the west. It was Ashley’s idea for trappers, Indians and traders to meet annually in a predetermined location to exchange furs, goods and money. The first mountain man’s rendezvous took place on Henry’s Fork of the Green River in what is now Wyoming in 1825. Ashley’s innovations in the fur trade earned him recognition, money, and helped to open the western part of the continent to American expansion. In 1826, he sold the trading company to Jedediah Smith and other traders and moved on to politics, becoming a U.S. Representative. When Missouri was admitted to the Union Ashley was elected its first Lieutenant Governor. Ashley died of pneumonia in 1838 and was interred atop an Indian burial mound in Cooper County, Missouri. Interesting. While I did find one reference (True West Magazine article) agreeing with your comment, several other references I found show the Rocky Mountain Fur Company organized in 1822, including the Encyclopedia Britannica. Can you point us to another source, we’d be happy to correct and properly attribute? Thanks!